Among the many vehicles at the 2012 SEMA Show was the bright red 2013 Ram 1500 regular cab short bed model that sported the vintage “Little Red Express” name and design scheme complete with exhaust stacks but unlike the 1978 red-and-gold sport pickup – the truck at the 2012 SEMA Show packed a turbocharged 5.7L Hemi engine. The Little Red Express pickup based on the 2013 Ram 1500 regular cab short bed (RCSB) model on display at the 2012 SEMA Show was designed with this vintage designed to help show off some Mopar aftermarket accessories including the “Power Bulge” style sport performance hood, the optional 22” aluminum Mopar wheels and the Katzkin leather interior packages that available from Mopar. 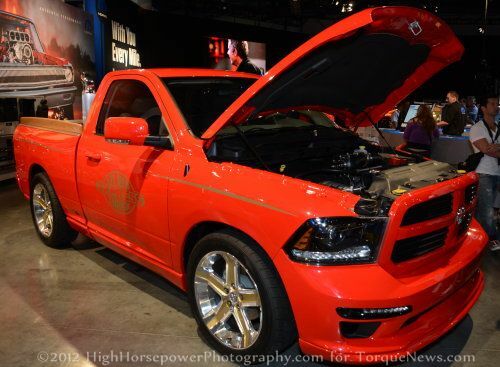 However, a truck with wheels, leather interior and a custom hood won’t be anywhere near flashy enough to draw attention at SEMA so Mopar added a wooden bed finish similar to that seen on the 1978 Lil Red Express Dodge Ram pickups as well as the exhaust stacks and the gold decal package that adds stripes along the sides and logos on the doors and tailgate. For those unfamiliar with the Little Red Express name, the Dodge Ram D150 had a trimline that sported the name Lil Red Express in 1978 and 1979. These high performance pickups were built into a loophole in the emission laws at that time allowed them to be built without the restrictive catalytic convertors and because of that, these Flareside pickups packed 230 horsepower (it was a lot at that time) with a 360 cubic inch V8. To get an idea of how fast this truck was, the Lil Red Express was the fastest stock vehicle from 0-100 miles per hour offered by an American automaker in 1978 according to testing by Car and Driver. While it was a sport truck, it featured a wood covered bed surface with more wood trim on the bedsides with huge exhaust stacks protruding through the front corners of the flared bed. This package has proven to be one of the most sought after classic Dodge pickups and it harkens enough fond memories that companies like Golden State Performance are offering appearance packages for the new Ram 1500 pickups. Click here for a look at the Mr. Norm Red Express truck in more detail. Now that the Mopar crew has shown off a modern Little Red Express of their own, it will almost certainly rekindle rumors of a production sport truck from the Ram Truck brand wearing this name. The 2013 Ram 1500 Little Red Express on display at the 2012 SEMA Show doesn’t feature the flared bedside but Mopar did run some unique stacks through the wood covered bed floor that surely allows the 5.7L Hemi V8 to proudly announce its presence. Speaking of that Hemi – while the 390 horsepower makes this modern Red Express truck much quicker than the older models, Mopar saw the need to pack even more power into this sleek sport truck so a Banks Sidewinder turbocharger system has been added to boost the output of this vintage themed truck. No power estimates have been given but considering the power made by other Banks-boosted pickups – this truck could be seriously fast. While this truck might not mean much to someone unfamiliar with the vintage Lil Red Express Dodge Ram, there is no question that this bright red pickup packing a turbocharged Hemi V8 was a crowd pleaser at the 2012 SEMA Show. Click any of the thumbnails above on the right for a closer look at the Little Red Express Concept Ram 1500 from SEMA!